I’m a blogger with good intentions… or in other words, “I’m so behind with intended blogging!” I haven’t even shown you the patterns I released in April! And there’s another that I released last week I want to share, but first things first. Please indulge me as I attempt to catch up. 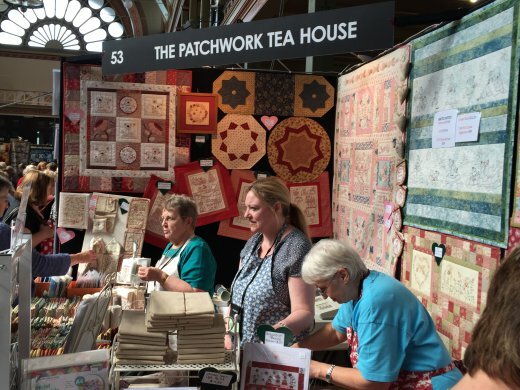 Back in April, I spent a wonderful few days enjoying the Australasian Quilt Convention on The Patchwork Tea House stand. This has been an annual event, but this year felt different as it was to be the last AQC I would spend with The Patchwork Tea House and with this particular group of wonderful women. 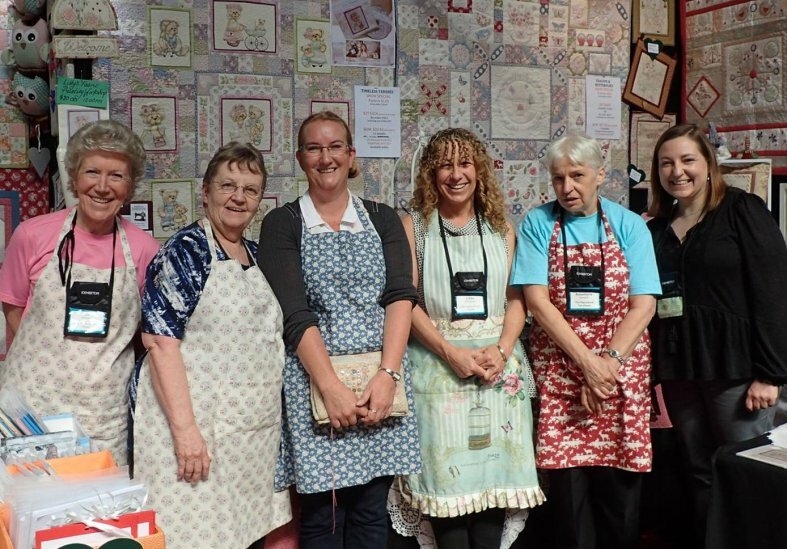 Lisa Cantlay of Fignberry, Liz Stanway of Teddlywinks, Annemarie Campbell of Eberius Patterns, Libby Richardson of Artsmart Craft Cottage, Katrina Webber of Robin Red Thread and myself all worked with Marilyn Barker for The Patchwork Tea House’s last AQC. 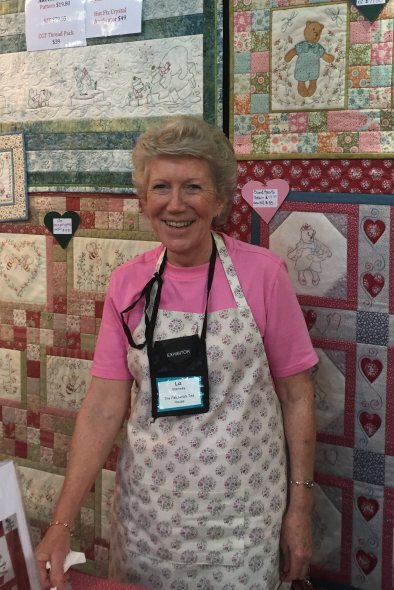 Marilyn and Gary retired their shopfront in Warburton on May 1st, but continue to remain open on their website and attend several quilting shows and events. It was also the last AQC for lovely Liz Stanway of Teddlywinks, as she and David move into retirement. Even though we are facing the end of some things, Marilyn, Gary, Liz and David are facing new beginnings. I’m excited for them and wish them all things wonderful for the future. This last AQC together was a bit of a milestone for all of us, and I’m so glad to have been there. 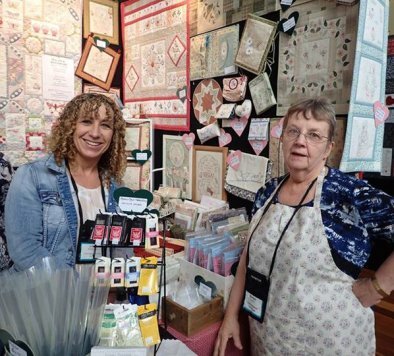 I released two new patterns at AQC this year, “Roses and Ruching ~ pincushion” and “From the Fields ~ organiser”. I originally designed these projects for Libby Richardson’s Girls Day Out event in March and reworked them in Tilda fabrics for my pattern release. 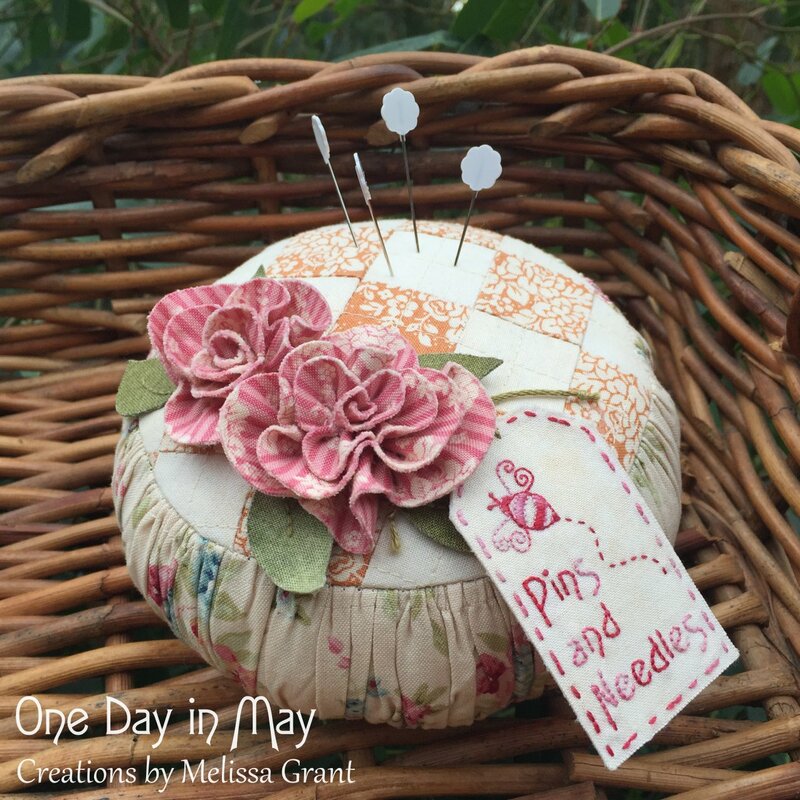 Roses and Ruching ~ pincushion combines patchwork, quilting and ruching with dimensional roses, leaves and an embroidered tag… all made with double-sided fabric. The top of the pincushion is pieced with two fabrics then quilted through the centre of each row. I’ve used a large floral print for the side, which I’ve ruched for added interest and a texture. 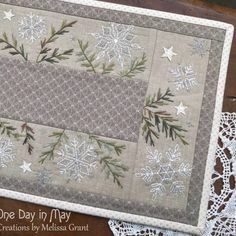 Double-sided fabric is so easy to make and can be used in a great variety of ways. I use it to add dimension to many of my projects, including this one. 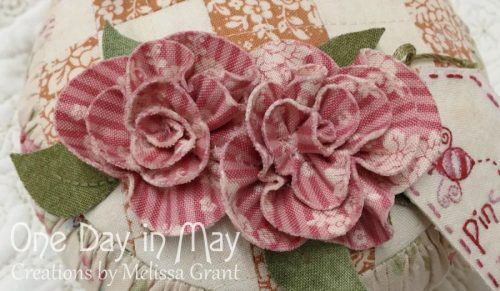 The long shapes made to create the roses are cut from double-sided fabric, gathered, wound up and secured with stitching. 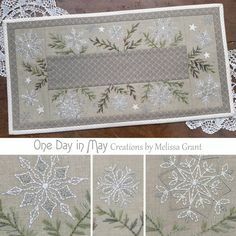 There are lots of photos in my pattern to show you how, and once you’ve made a few you’ll be dreaming of how else you can use them. 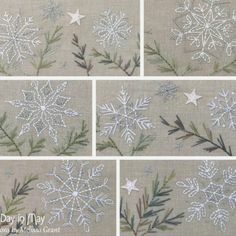 They can be made in any light-weight fabric and applied to a headband, cushion, quilt, embroidery panel and more. The leaves are also cut from double-sided fabric. A simple leaf vein is stitched down the centre to attach them to the top of the pincushion. The double-sided fabric is fused together well, allowing the raw edges to be left unsewn. The leaves are only partly sewn down, so are free to sit up, adding dimension to the piece. The Pins and Needles tag design is firstly embroidered and then used to make double-sided fabric. 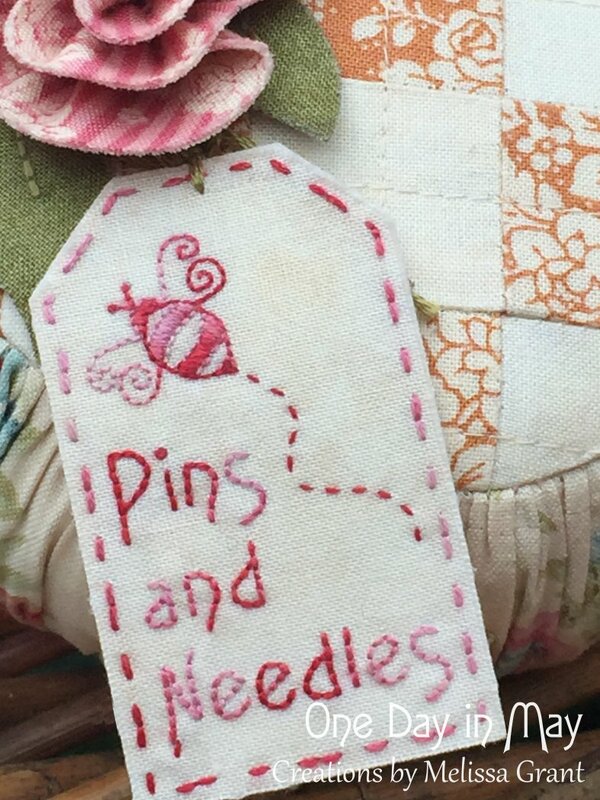 The tag is then cut out and attached to the pincushion. I use double-sided fabric for all sorts of things… it’s so versatile. 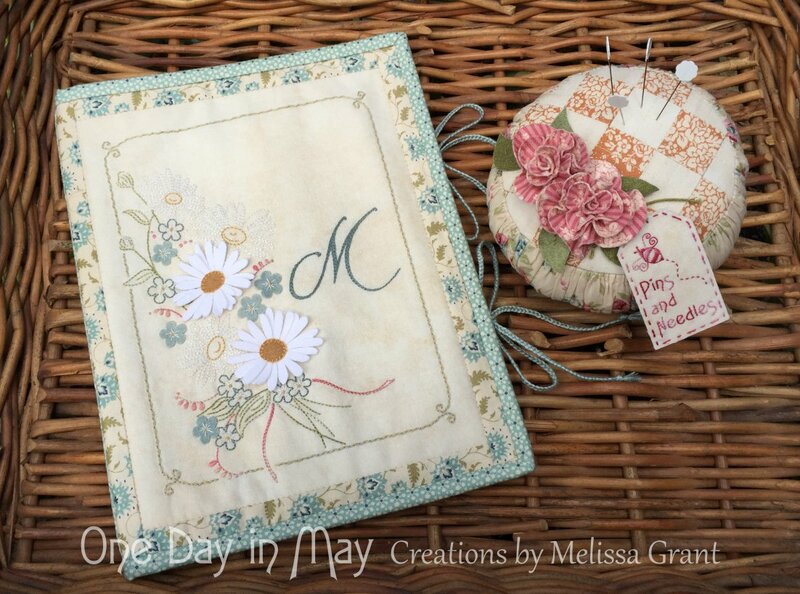 This project is perfect for those looking to explore a few of those techniques. The pincushion is 5 ½” across. 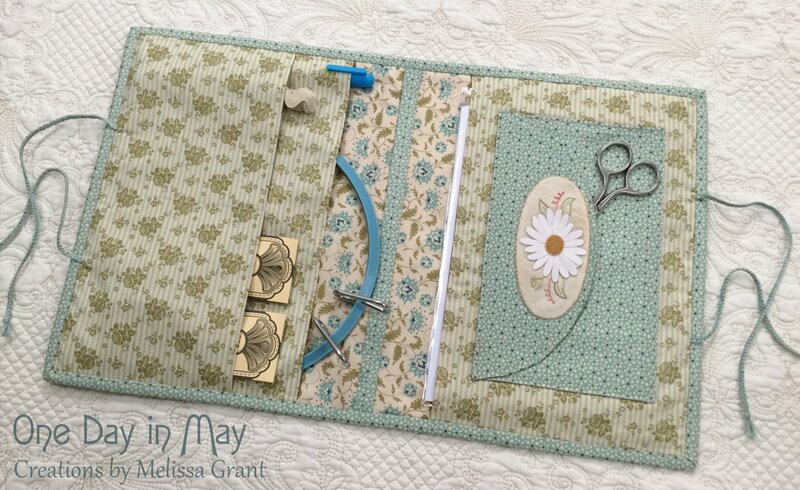 It’s both decorative and functional… a great small project for your sewing space or for giving as a gift. 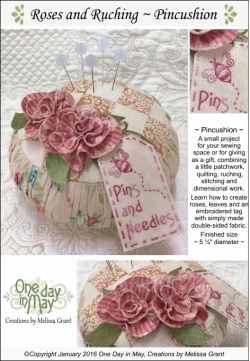 Order your copy of “Roses and Ruching ~ Pincushion” through your local patchwork store, One Day in May stockists or HERE in my online store. I love a practical project, and “From the Fields ~ Organiser” is just that. Carry the essentials for your sewing project, journal and stationery, or jewellery and scarves in this pretty, personalised organiser. 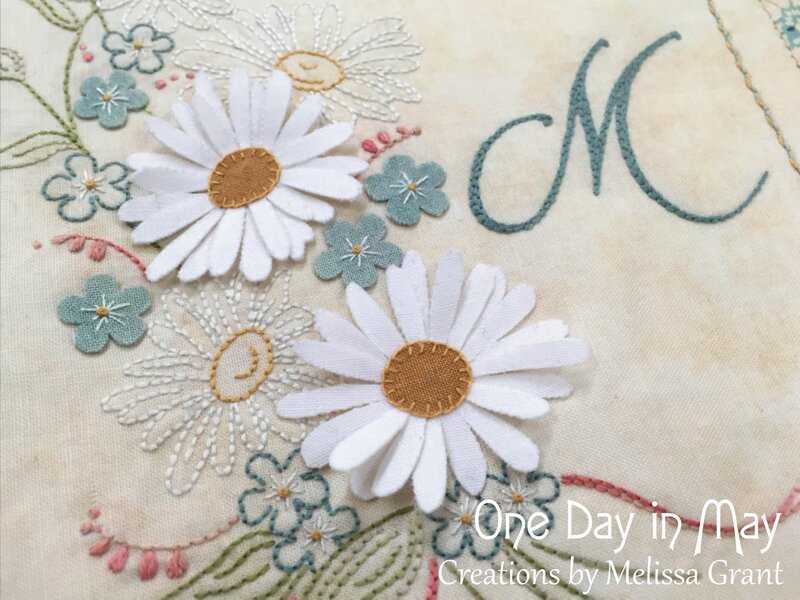 The front features your initial of choice and a vintage style embroidered bouquet with dimensional fabric daisies and forget-me-nots. The organiser is approximately 8” x 10 ½” when closed. 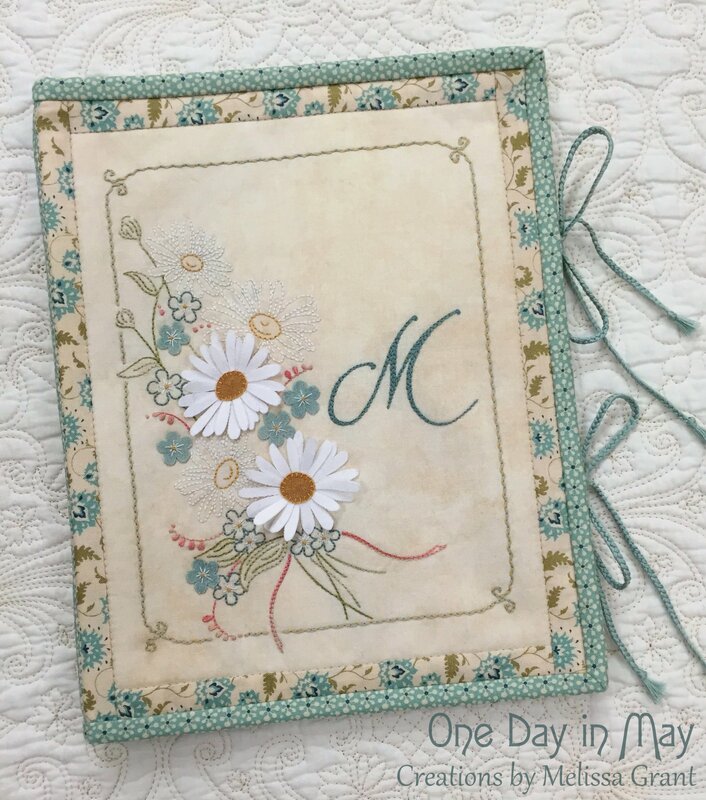 The embroidered cover features daisies and forget-me-nots cut from double-sided fabric. The flowers are simple to create and are only partly attached to the panel. This allows them to sit up a little from the background and cast a shadow, giving the design a dimensional quality. A full alphabet of decorative initials is supplied in the pattern sheets, allowing you to personalise the project for yourself or as a gift for someone special. 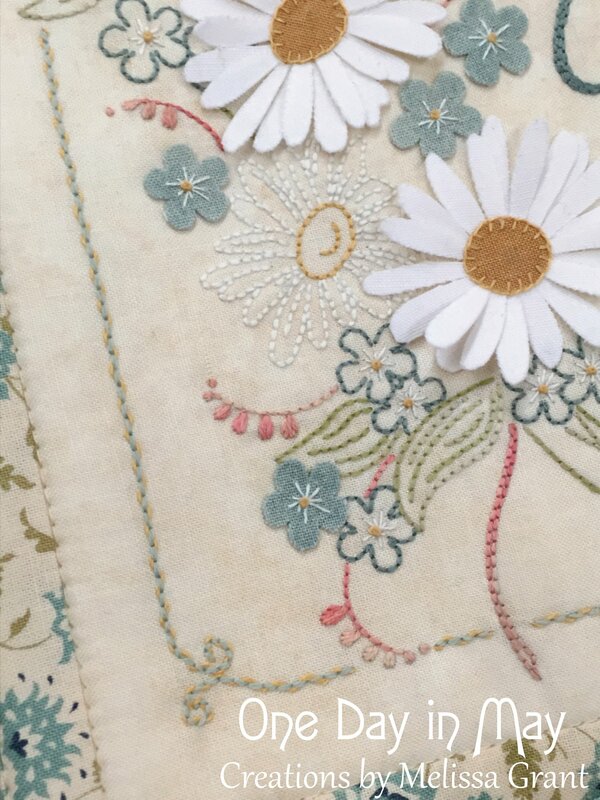 The embroidered panel is edged with threaded back-stitch, worked in two tones… a light blue thread for back-stitched base, threaded with a soft yellow. The cover panel design is also suitable as a standalone project. Simply add a border and it’s ready to frame. 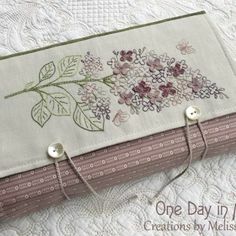 From the Fields ~ Organiser has three open pockets and a closed pocket embellished with applique, embroidery and a dimensional daisy… plenty of space to store an embroidery project, pattern, notions and threads. A5 sized notebooks or journals also fit easily, along with other stationery and your favourite pens. 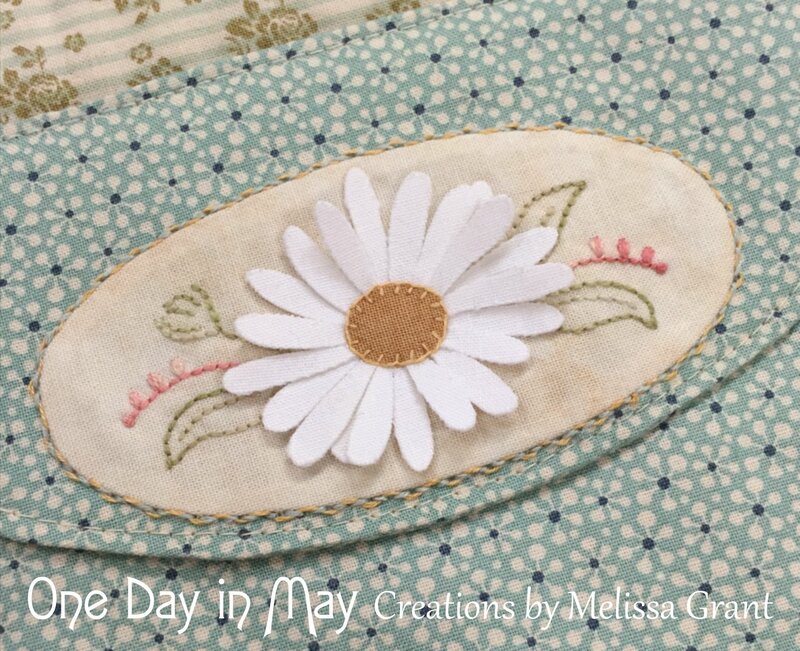 The appliqued oval featured on the closed pocket is also edged with the threaded back-stitch. I think it looks a little like a fine lace edge and it brings another element of the cover design to the inside. Order your copy of “From the Fields ~ Organiser” through your local patchwork store, One Day in May stockists or HERE in my online store. I have one more new release to show you this week, but I’ll save it for the next post. A quick note to say thank you for the wonderful feedback you’ve given me for my project featured in this month’s Homespun Magazine. I can’t tell you what an encouragement it is… and I appreciate, so much, that you’ve taken the time to get in touch. Lovely designs Melissa, as I think we have all come to expect. I have enjoyed completing your jewellrey keep and pouch, sewing tidy and am doing your Xmas embroidery at the moment. The craft day at Stawell was enjoyable and informative also. I love decorating the house for Xmas and the sweet treats would look lovely. Your instructions are so easy to follow making it a pleasure to create. Thank you Melissa.